Can you say ultimate leftovers? 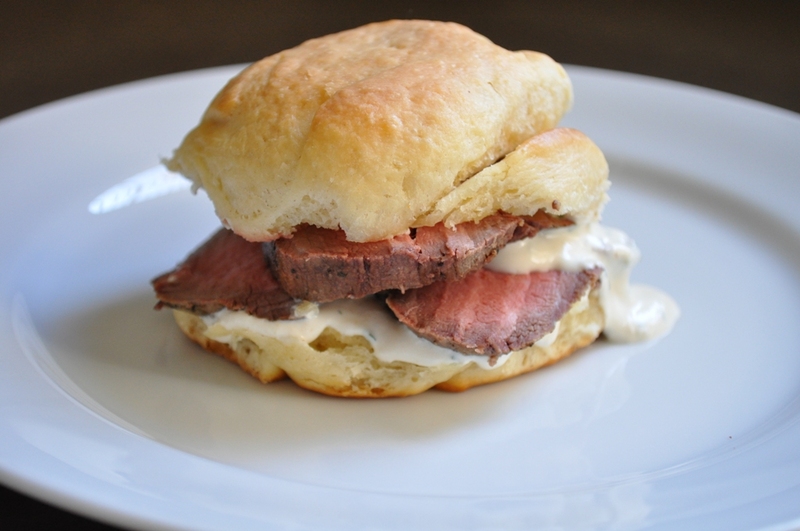 This sandwich was made from left over filet of beef tenderloin with creamy horseradish sauce that Hubby and I made for our Mystery Dinner this past weekend. Mystery Dinner is our fun new monthly activity that Hubs and I came up with as way to try new dishes at home and work together in the kitchen with a glass of wine in hand. This month's dinner started with this 44-clove garlic soup and ended with creme brulee (to be posted on Friday). And in between, our eyes rolled in the back our heads and closed, along with some grunting noises and murmurs like, "Mmmm", "Wow! ", "Oh my God!," as we ate this filet of beef. It was AMAZING. It was melt in your mouth delicious. By far, the best beef we've ever made at home. Tender, juicy, flavorful. Heavenly, really. I don't know if this was the wine talking, but I couldn't have been more happy with how this turned out. And the horseradish sauce was a nice cool, creamy and spicy accompaniment. Horseradish and beef are destined for each other. This was so easy to make and the ingredients couldn't be more simple. Filet of beef, butter, salt and pepper. That's it! Seriously. Goes to show you that delicious meals don't have to be complicated. This recipe comes from Ina Garten's Barefoot Contessa Parties cookbook. Her original recipe calls for a 4 to 5 pound tenderloin but since it was just the two of us, we purchased the smallest one behind the butcher's counter at 2 pounds. We halved the rest of the ingredients and kept the cooking time and temperature the same. From what I understand, tenderloins are typically the same width and a larger filet is just longer and not thicker, so I didn't adjust the time in the oven. The tenderloin goes onto a baking sheet in a 500 degree oven for exactly 22 minutes for rare and 25 minutes for medium rare. We went with 22 minutes and it was perfect! I recommend using an oven thermometer to verify your oven is up to temperature. I will say that filet of beef is not something that we buy every day. In fact we have never bought a whole tenderloin before. I've always wanted to make a tenderloin though, and Mystery Dinner was the perfect opportunity. We went to our favorite butcher where we know they have the freshest, highest quality products and we forked over the credit card. It better be high quality at $27.99 a pound! But the splurge was worth every penny. So incredible! Did I mention how amazing this was? This would make a great special occasion dinner, like New Years Eve, Valentines Day or why not Columbus Day? Treat yourself! I wish I had snapped a photo of this gorgeous tenderloin the night we made it, but I have decided that I really can't stop and do a mini photo shoot in the middle of our Myster Dinner preparation. Plus the lighting is no good at night. But trust me when I say it was beautiful! We got 3 meals out of the filet of beef (1 dinner and 2 lunches) which makes the price a little easier to handle. 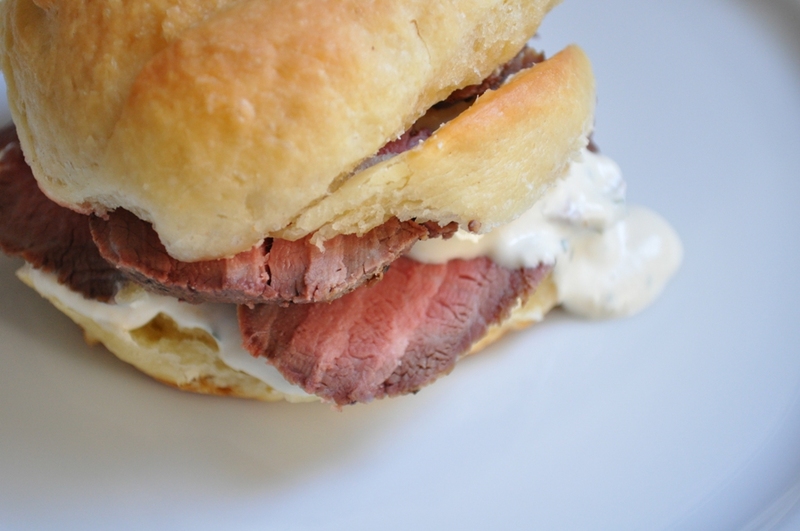 We used homemade dinner rolls slathered with plenty of horseradish sauce and stacked with beef for these tasty little sandwiches. If only all leftovers were this good. If you are beef lover and have never tried to make a filet of beef tenderloin at home, you have to try it. It really couldn't be easier! Preheat oven to 500 degree F. Line a baking sheet with foil. Pat the filet dry with a paper towel. Rub the beef with butter and sprinkle with salt and pepper on all sides. Bake for exactly 22 minutes for rare or 25 minutes for medium rare. Remove from oven and transfer beef to a cutting board and cover tightly with foil. Allow it to rest 15-20 minutes at room temperature. Remove strings and slice in thick slices, 1/2 - 1 inch thick. Serve with horseradish sauce (recipe below). Combine all ingredients in a small bowl. Cover and refrigerate for at least 30 minutes or until ready to use. What a yummy sandwich. I do love the taste of horseradish on beef. This looks like the perfect sauce. I'll keep it in mind when I have leftover beef. Thanks for the recipe! Makes me hungry just thinking about beef fillet, and it is even more interesting when there’s horseradish to complete the meal. Maybe a good can of beer could really make it more irresistible, or for the fancy drinker, a red wine would certainly add depth to the whole experience of eating such a wonderful dish like this.